A dealer is the player who deals cards at all tables in all rooms that make up a specific group, and they also get a certain share of all the money winnings in that room group. You can become a dealer by investing some Respect points; bear in mind, however, that Respect count is reduced by 1 point every 15 seconds. 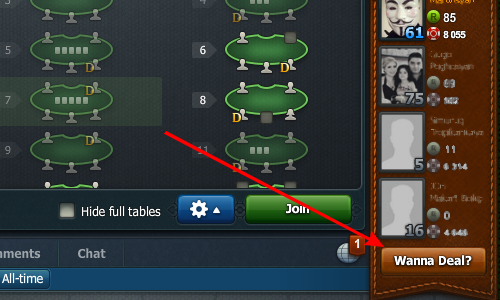 In order to become a dealer, all you need to do is select a room and click on 'Become a dealer' in the bottom-right corner of the table. The Wheel of Fortune is simply another means to earn chips, Respect points, or coins. You can easily find it in the top part of the game window. The principle is identical to that of the Slots: you select the type of currency you want to win and start the drum by clicking 'Spin' or pulling the lever. You can win twice as much if you use the 'Double payout' option before you get spinning. Best of luck! 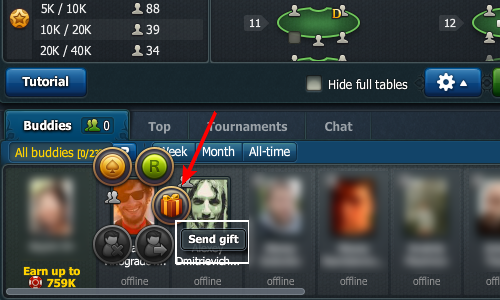 Mouse over the player’s avatar, click on the pop-up icon and select what exactly it is that you want to send as a gift. You can send a private gift, with your name and accompanying message hidden from everyone but yourself and the recipient, or make an anonymous gesture (nobody but you will be able to see your name). You can also send a gift, offering your friendship. 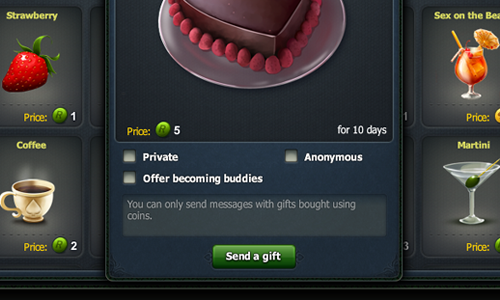 If you purchase a gift with coins, you can attach a note to go with it, too. Why do I need collections, and how do I complete them? Each collection’s description will let you know how you can obtain pieces from it. It might be about playing at tables of specific parameters, tournament participation, playing particular hands, and so on. There is a limit on the number of pieces from each specific collection that you can obtain in one day. 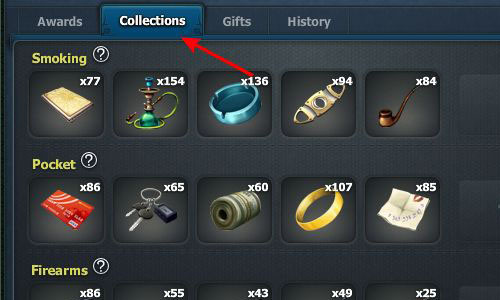 Once you have obtained all 5 distinct collection pieces, you can exchange the whole lot for a nice reward. If you’re missing one or more elements from a collection, please use the opportunity to exchange pieces with other players at a rate of 1 piece per hour. Select the piece you want to obtain and click on 'Exchange', and then indicate the piece you’re willing to put forward for a swap. Bear in mind: this exchange may take some time to process, as we look for a matching player to complete the transaction. Why do I need buddies? A buddy is your in-game World Poker Club friend, whom you can always find in the game and 'visit' by, say, joining them at a specific table. You can become buddies with any World Poker Club player, including those who you are not friends with in the social network. 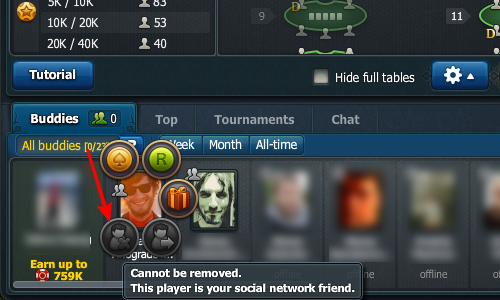 To become buddies with a player, mouse over their avatar and click on the 'Buddies' icon that pops up next. You can always see which of your buddies are online from the room lobby, as well as what tables they’re playing at. How do I get a medal of friendship, and what good is it for me? 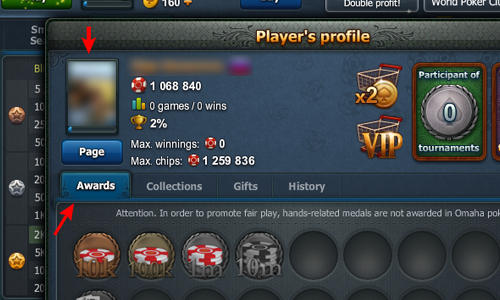 You can be awarded a special medal of friendship in our World Poker Club. Remember that it is awarded only for introducing new players to the game, i.e. those who only installed and ran the application for the first time upon your invitation. The more friends you have, the more chips you get with your daily bonus; in fact, all your rewards increase as the number of your friends grows. But do not forget that creating additional accounts in order to be able to invite those 'fake' players into the game to gain achievements and increase rewards is a serious violation of our policy, and it incurs blocking one’s game access. Why do I want to receive awards? How do I play full-screen? There are hot keys in the top-right corner of the game screen, which will help you launch the full-screen mode, as well as switch music and sounds on and off whenever you feel like it; oh, and you can take screenshots of the game, too! I do not know any poker hands. Royal Flush ("highest of the same suit strictly ordered"): the 5 highest-ranking cards (Ace, King, Queen, Jack, Ten) of the same suit, for example: A♥ K♥ Q♥ J♥ 10♥. Straight Flush ("same suit strictly ordered"): any 5 cards of the same suit ordered one by one in rank, for example: 9♠ 8♠ 7♠ 6♠ 5♠. Four of a Kind, or Quads ("four of the same kind"): 4 cards of the same rank, for example: 3♥ 3♦ 3♣ 3♠ 10♥. Full House, or Full Boat ("full house" says it all, really): 3 cards of the same rank + one pair, for example: 10♥ 10♦ 10♠ 8♣ 8♥. Flush ("one flush", "one breed"): 5 cards of the same suit, for example: K♠ J♠ 8♠ 4♠ 3♠. Straight ("straight order"): 5 cards of any suit ordered one by one in rank, for example: 5♦ 4♥ 3♠ 2♦ A♦. The Ace may either open or close the combination. In this particular example, the Ace (A♦) opens an order of 5 cards, therefore its rank is likened to 1, and 5♦ is considered the highest card. Three of a Kind, or Set ("set of three"): 3 cards of the same rank, for example: 7♣ 7♥ 7♠ K♦ 2♠. Two Pair ("two card pairs"): 2 pairs of same-ranking cards, for example: 8♣ 8♠ 4♥ 4♣ 2♠. One Pair ("one pair of cards"): 2 cards of the same rank, for example: 9♥ 9♠ A♣ J♠ 4♥. What are violations, and what do they imply? Any violation imposes a penalty (resetting the player’s game balance) and/or blocking the player’s game access (limiting the user’s access to the game by blocking their specific account details within the application). A player who has incurred 5 penalties over the course of their "history" with the game receives a permanent ban from the application without prior notice. Selling game valuables to, or buy them from any other user(s) via means that are not accounted for by the game mechanics. 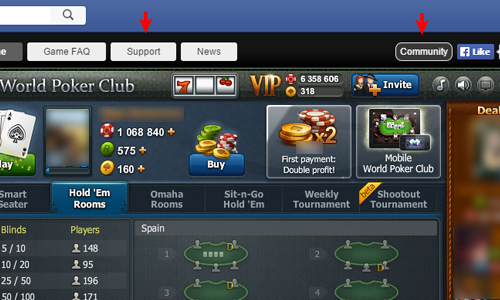 The World Poker Club reserves the right to ban access to the application for any user account, take other measures or actions at any time and for reasons that include, but are not limited to, the violations listed above, including those defined in the User Agreement. The major criteria for making a decision to ban a user account is the user committing any actions that halt regular gaming process, contradict the game spirit and concept, and/or harm the principles of competition and equal rights for all players. You’re welcome to familiarize yourself with the complete user agreement here. How can I get in touch with the game team? It is very easy to do: just click on 'Community' in the browser menu just above the game window, join the community and ask all the questions you have in appropriate sections. Moreover, you can now follow all the game news, receive bonuses and special links, and many other things! You can also contact the game team by clicking on 'Support' just above the game, on the left: fill in the fields and submit your question. The message will be sent to the game administration team, and the response will arrive by email within the next 24 hours. 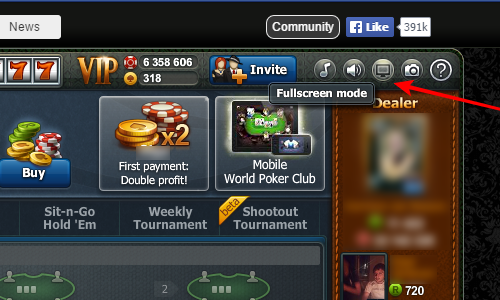 What do I do if the game window is cropped or not fully visible? Chances are your browser settings are incorrect. To solve this, run the game, right-click anywhere on the game screen, hold down the CTRL key and press '0' (zero). What does the Smart Seater do? The Smart Seater option helps you take a seat at a perfect table by matching all the parameters you enter beforehand. You can select the type of poker (Texas Hold ‘Em or Omaha), the blinds, the number of players, and the type of table. 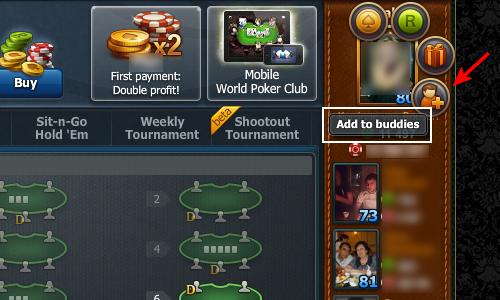 What tournaments can I play in the World Poker Club? The Sit-n-Go is a tournament with no set starting time; it begins as soon as all the seats are filled. The Flip-n-Go is a fast and exciting tournament with all players automatically going all-in in every game, for as long as it takes for a winner to be determined. The Weekly tournament is held every week and goes on for seven days exactly. The game is played for tournament chips, which you can obtain in the quantity you want upon registering for the tournament. When the tournament is over, top 20% of chip leaders split the pot (it depends on the total tournament chips involved in the game), and the top 100 players (by chip count) receive coins and Respect points. You can leave the game any time you want; upon return, you will continue with the same amount of tournament chips that you had when you left. You cannot buy additional chips while in tournament. If you’ve lost all your chips, you automatically leave the tournament, but you can re-enter with new chips and play more. The Shootout tournament is a special tournament held at several tables at once. The tournament lasts for a few rounds, the exact number of which depends on the total number of registered players. All the tournaments start at specifically set time, and the prize pool depends on the number of participants. The chip-leader from each of the tables advances to the next round, where they challenge other chip-leaders for the position in the final round. There are 6- and 9-player tournaments available. What is so good about going VIP? 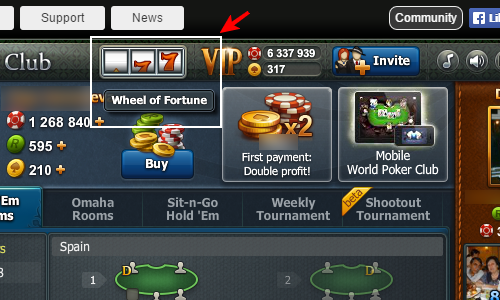 VIP status grants you the advantages of using private chats, employing the Chance-o-Meter for free in order to determine your odds of winning, sending unique gifts, retaining your combo-bonus and hiding your game history. 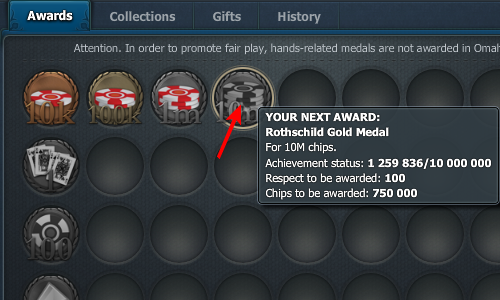 You can purchase the VIP status for chips or golden coins. 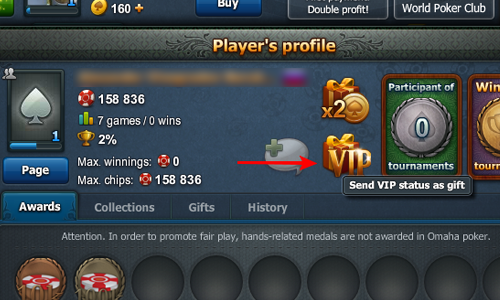 You can also send VIP status as a gift to another player by opening their profile and selecting 'Send VIP status as gift'. This Chance-o-Meter is an official tool for any poker strategist. It helps determine your chances of winning – the so-called poker odds, and does so in full compliance with any rules or laws: it takes into account the number of players at the table, your hole cards and the community cards. You can use the Chance-o-Meter at a modest rate of 10% of your winnings; in case you lose, you pay nothing. What does the 'Rebuy' option do? The Rebuy is a function that lets you top up your chips during the game without losing your seat at that particular table. 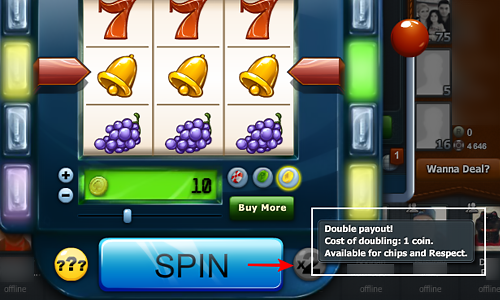 Click on 'Rebuy' as you play and get as many additional chips as you need.